One-on-one learning with a personal coach for instant results. Scalable solutions for all group sizes across multiple locations. Premium solutions for corporate leaders and senior management. Match groups and content with deep integration of work-related topics. 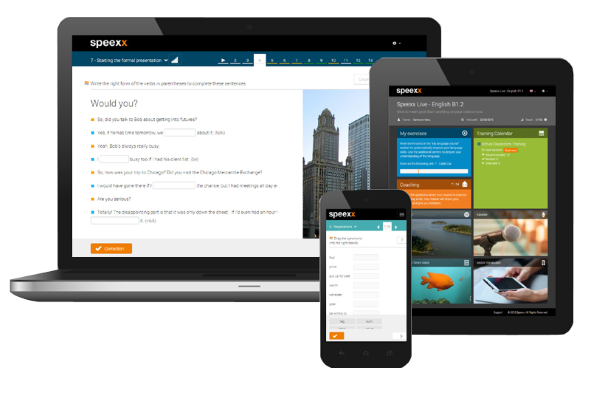 Use Speexx to manage the change from traditional to blended learning. Online training for remote areas with Speexx technology solutions. Fully blended language skill assessment and development experience. Direct access to 1,500+ certified online coaches 24/7. Training administration, reporting, business analytics and tech integration included. Available for Business English, Spanish, German, Italian and French. Break Down Your Communication Silo! Empowering Communication across all borders and language barriers.